I�m extremely fond of the so-called �slow burn film.� While they�re certainly not for most of today�s multiplex-going masses who prefer an explosion every five seconds over a slowly-unwinding story that will stick with you for days, I�ll take these infinitely more rewarding movies any day. 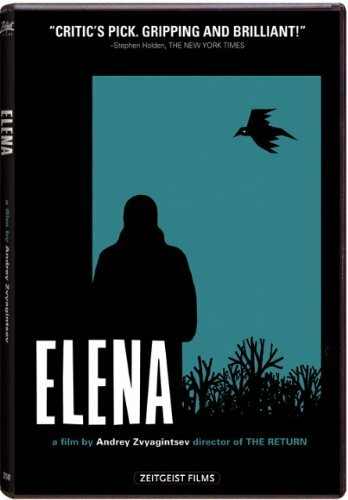 Russian director Andrey Zvyagintsev�s (The Return, a Golden Globe nominee) 2012 film Elena, is the epitome of a �slow burn film.� There�s barely any dialogue in the first 10 minutes of the film, and numerous extended sequences take place with similar periods of quietness. Yet Zvyagintsev says so much by saying so little, allowing us to stay on edge as we await the next shocking twist that he has in store for us. Thankfully, Zeitgeist Films allows us to experience each and every minute of this criminally-unseen recent foreign masterpiece, thanks to their wonderful new DVD release. The title character, Elena (Nadezhda Markina), is one of the more interesting figures to come along in some time. We are introduced to her as she is performing maid-esque (for much of the first quarter of the film Zvyagintsev had me convinced that Elena was, indeed, a housekeeper) duties for Vladimir (Andrey Smirnov), an aging man who doesn�t exactly ooze happiness or even attempt to disguise gruffness with a kind demeanor. Following the subtle revelation of Elena and Vladimir�s true relationship (one of the many twisty plot points I won�t spoil here), the latter suffers a heart attack and a series of shocking events are set into motion. Again, that�s all you�re going to hear from me regarding Zvyagintsev�s brilliant direction of his and co-writer Oleg Negin�s screenplay, but just know, that, in the end, you�ll be far more fulfilled experiencing Elena in the comfort of your own home than you will be trudging out to see the latest action-packed snooze fest in 3-D, 4-D, or whatever �D� they�re up to these days.